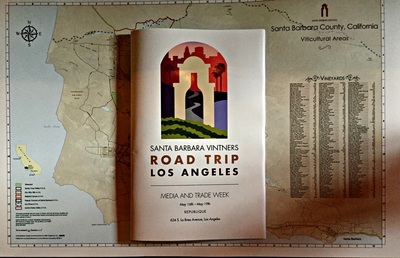 Day Two of the Santa Barbara Vintners Road Trip Los Angeles focused on the elusive Pinot Noir. Ethereal, sensual, or brooding, Pinot Noir, more than any other wine grape, reflects where it is grown. For winemakers, it’s not just the soils, climate or weather, it’s the number of clones that shape the wines they make. 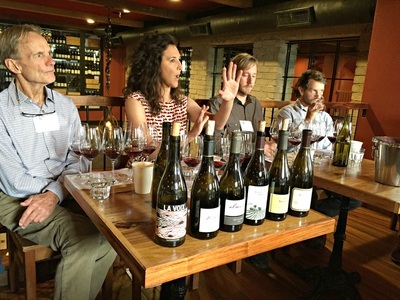 The Pinot Noir seminar, moderated by acclaimed wine writer Elaine Chukan-Brown, explored six Pinots from Sta. Rita Hills and Santa Maria Valley, with five winemakers joining the discussion. Steve Clifton of La Voix, Blair Fox of Fess Parker, Richard Sanford of Alma Rosa, Trey Fletcher of Solomon Hills, and Ryan Pace of Nielson, mused about their adventures in Pinot Noir, and how their wines have condensed the very special place of Santa Barbara County. Chukan-Brown set the stage, with geology the driving force of soils and climate. She noted that the sharp elbow of California at Point Concepcion reveals the ancient foundation of today’s spectacular wine country. Instead of the norm of mountain ranges running north to south, Santa Barbara County has east-west hills, a result of tectonic plates crashing into each other. What she called the “nook effect”, the collision of warm and cold ocean currents brings a huge maritime influence to these valleys, funneling cool Pacific breezes across the region. In addition to cold winds, nightly fog blankets the grapes, moderating temperatures while developing acidity, aromas, and flavors. The vineyard soils originate from the deep ocean; limestone, sand, and diatomaceous earth, which are great for wine grapes. This is the only place in the North American continent where these phenomena come together, making this a truly unique cradle for the finicky Pinot Noir. For Pinot Noir producers, the Holy Grail has always been the wines of Burgundy, and while all these winemakers were inspired by them, they recognized that the Pinots of Santa Barbara County are different. Burgundy’s high-toned fruit imparts an earthy, forest floor aromatic to their wines and are vintage dependent, where Santa Barbara’s riper fruit yields bigger and bolder wines, good in most years. Yet both share a great affinity for food pairing. 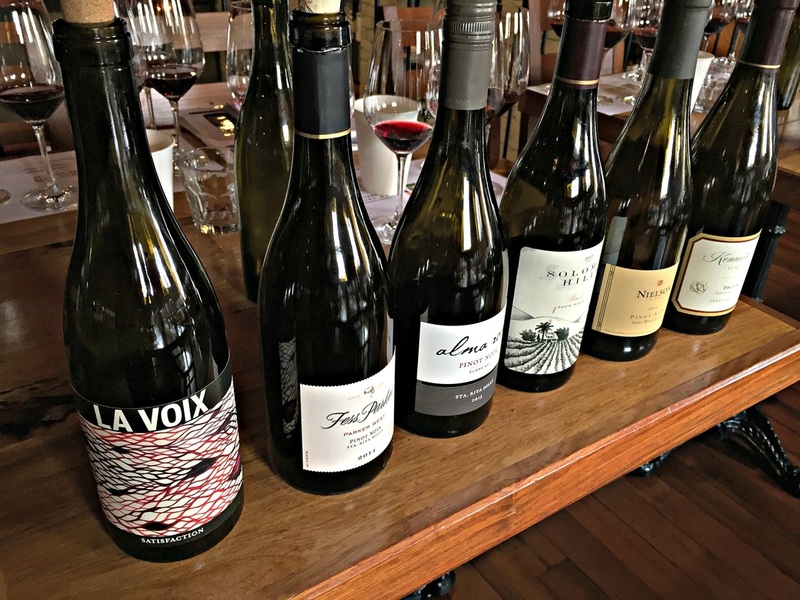 La Voix’s Clifton commented, “I think it’s very obvious in these wines, the mineral, the saline, the brine-like quality that peaks through in the wines, it’s what, in my opinion, makes these wines work so well with food. The same way that salt can enhance the food, it sets your mouth up for the flavors that are to come.” Just like the Chardonnay dialogue of the previous day, salinity once again seemed to define Santa Barbara Pinot Noir. Alma Rosa’s Sanford, the visionary pioneer that first identified the wine-grape growing potential of the Sta. Rita Hills, agreed, “Truly it’s that marine influence that prompted me to come to plant Pinot Noir here, because the diversity of climate in our region is probably greater than anyplace in the world.” Fess Parker’s Fox found the sandier soils in some areas definitive, “You can feel the fineness, the transparency in the wine, it seems almost as though it’s been filtered by the sand, it has that leaner sort of elegance rather than the meatier clay influence.” Nielson’s Pace felt he could differentiate the darker, fleshier notes of Santa Maria Valley Pinot from the saline, feminine elements of Sta. Rita Hills. What makes for a fascinating experiment with these Santa Barbara Pinots is the many clones used by the winemakers, either a single or blend of several, like a work of art or piece of music, where the creator can choose according to the final vision he or she wants to bottle. Sanford summarized, “Pinot Noir tends to be genetically unstable, it does change over time depending on place, this is why it probably shows place more than any other variety.” Whether it’s Clone 667, with its big, meaty-like quality, or Clone 115, lighter, red-berried, more elegant and feminine, Clone 777 with its spicy element, or Pommard Clone that is big, muscular, and intense, the clonal diversity of Pinot Noir is astounding. It’s a gift to winemakers, who can make entirely different 100% Pinots from the same vineyard sites. Tasting through the wines from Santa Maria Valley and Sta. Rita Hills, it wasn’t so easy to align these Pinots according to vineyard sites, but more of a magical confluence of clones, climate, farming and winemaking decisions, whether whole-cluster fermentation, neutral oak, native yeasts or blending of clones. The 2013 Alma Rosa Clone 667 La Encantada Pinot Noir Sta. Rita Hills is a more intense wine, earthy and savory, with red and black fruit, dried herbs, spice, and leather notes, it’s full mouthfeel ends long and luscious, a classic example of a single clone Pinot Noir from the Sta. Rita Hills. Wes Hagen of J. Wilkes Wines, one of the driving forces behind the creation of the Sta. Rita Hills AVA, attended the seminar and gave his take on Santa Barbara Pinot Noir. “It’s a confounding area, that we’re still trying to get our heads around. I think these conversations, trying to pigeonhole what works, are about 100 years premature. This is us reaching to try to understand something that’s in its infancy.” He believes the wines speak of place, but perhaps because of man’s contributions, like newer clones and trellising choices. And then there’s Mother Nature’s touch, for example, the winds that whip through the Sta. Rita Hills affect the vines’ photosynthesis abilities, sometimes resulting in higher alcohol wines with “champagne acidity”. Next up, Santa Barbara County Rhône-Style Wines, truly a cornucopia of white and red wines from the likes of Syrah, Grenache, Roussanne and Viognier, to mention a few, with intriguing fruit and spice!